Our enterprise Spam and Virus filtering service is simple to setup and eliminates 99% of unwanted emails. It also reduces load on your server as you will only receive legitimate emails. 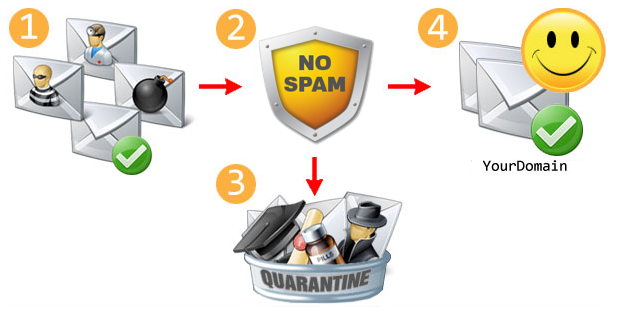 How does our Spam and Virus Filtering work? 1. Incoming, unfiltered email directed to your domain. Along with the good email you want, it includes a barrage of spam, phising and virus emails that you don’t want. 2. A simple change to your domain’s MX record puts our extremely powerful and remarkably accurate filtering service to work for you. 3. The bad stuff is put in a “quarantine viewer” so that there’s no chance of ever losing good email. In the unlikely event that a good message is blocked by our service, it can be viewed in either the included shared quarantine or optional individual quarantine viewers. Contact us now for a free quote or more information about this service.